We all love the taste of a frothy latte or cappuccino every morning to get our day started. However, buying coffee every morning in your favorite coffee shop can be pretty expensive. This is why the idea of making your own coffee at home makes sense. The problem is always getting the same high-quality coffee as the one sold in cafes. You need a frothing machine to make some of the best chai latte and cappuccinos. This is where buying the best milk frothers comes into play. Milk frothers help create delicious foam that will complete your coffee brewing. Choosing the best milk frothers is not an easy task. There are varieties of milk frothers on the market with a wide range of features. You first have to decide between handheld milk frothers and jug milk frothers. In this post, we are going to give a comprehensive review of the leading milk frothers on the market. Our reviews narrow down on the best brands to help you choose the best frother with ease. We will also share our buying guide on how to arrive at the best milk frothers. Make sure you read our reviews to the end to choose the best frothers with ease. 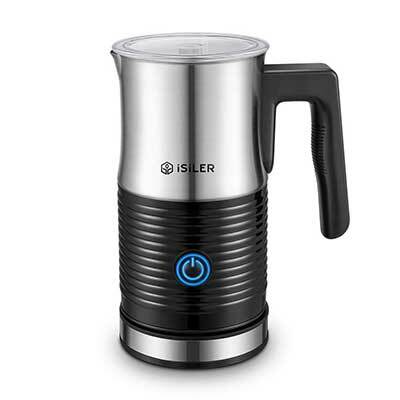 This is a large capacity 250ml milk frother and warmer. The frother helps make cold and hot milk froth ideal for making cappuccinos. It also heats hot milk to make lattes. It is a pretty versatile frother that can heat and froth your milk at the same time. The milk preparation capacity is 250ml while the milk froth preparation capacity is 125ml. 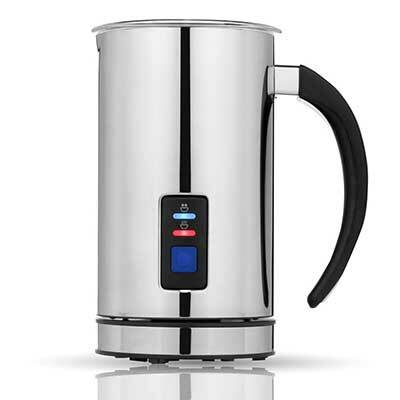 It is a sturdy frother with a stainless steel exterior and vacuum insulation to retain milk warmth. The frother further gives an indication of the maximum milk frothing and milk warming. It features a detachable base and comes with a free cleaning brush for easy maintenance. Overall, this is a simple and easy to use milk frother that operates easily with ON/OFF button. The Capresso milk frother is another top-rated choice and one of the best-selling milk frothers on the market. 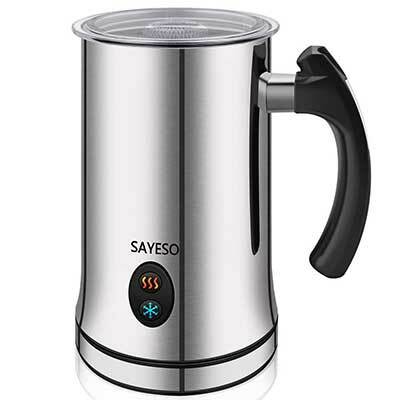 It perfectly froths and steams milk ideal for cappuccinos, café lattes and hot chocolates. It is a pretty versatile machine with the 8oz capacity for frothed milk and 12oz capacity for steamed milk. 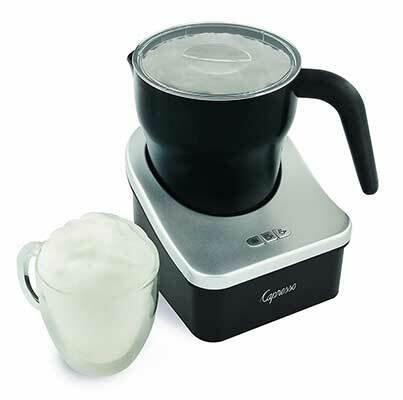 The frother features a see-through lid so that you can view the frothing and steaming process. It is also an easy to clean and maintain frother with a removable milk pitcher which is also dishwasher safe. Overall, this machine is quite safe with the heating disks safely secured on the bottom of the base. The controls are also illuminated for easy selection of warm, cold and hot. The VIV REAL is a standout milk frother that will give perfect and consistent milk froth. The frother delivers a smooth texture with plenty of bubbles. It also heats your milk to the desired temperature to get you the best milk lattes. It can heat milk fast to 150 F degrees in a few seconds. The construction of the frother is durable and sturdy with a double stainless steel wall. The double wall offers a vacuum for insulation keeping your milk hot. It also features a non-stick interior for easy cleaning and functionality. It is also a safe frother with an automatic on/off switch. The base is non-slip and made of silicone for safe use. Overall, this is an easy to use frother with a simple button operation and three multi-use settings. 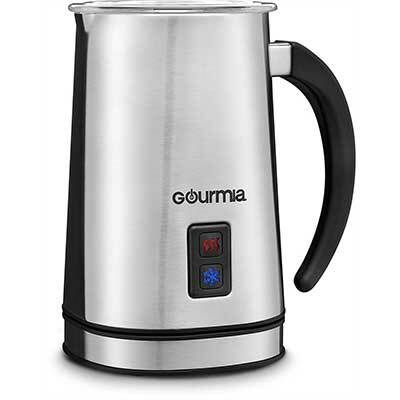 The Gourmia is a versatile three-in-one milk frother that will steam, heat and froth your milk. It is a sleek design frother with a simple one-touch operation. The frother will instantly froth your milk to perfection in seconds. It features a 360 degrees rotating base for a cordless carry. Overall, this is one of the easiest frothers that allows for easy pouring and carrying. You can lift off the base and pour your milk with ease. The interior is non-stick for easy cleaning while the exterior is stainless steel for long-lasting durability. The frothing capacity 115ml while the heating capacity if 240ml. It is also ETL certified so that you can buy with confidence. The Kuissential is another automatic milk frother and warmer that runs on a single button press. It features a maximum capacity of 240ml for warming and 115ml for frothing. It is an easy to use frother with indicators for maximum milk frothing and warming. You can use this frother to create the perfect milk lattes, cappuccinos and hot chocolates. Overall, this frother is sturdily made with a stainless steel exterior and a non-stick interior. It is also easy to clean with the base detachable. The vacuum insulation of the frother helps keep your milk warm for long when you don’t want to use it immediately. This is a smart design milk frother made of the highest quality stainless steel housing to look sleek and attractive. The frother features a vacuum insulation to maintain the temperature of your milk for long periods. It is also quite easy to clean with a non-stick interior that will not leave any trace elements of milk. The frother works fast, easy and silently with two press buttons that allow you to heat and froth your milk in less than a minute. 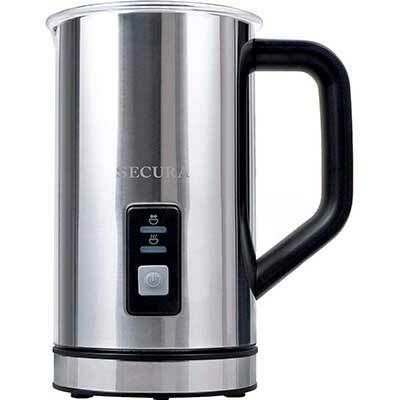 It operates quietly when frothing with 150ml frothing capacity and 300ml heating capacity. You also get a free cleaning brush to make cleaning easier. Overall, this frother is an excellent buy with users getting a free 24/7 customer service. This is a multi-functional milk frother that makes both hot and cold milk froth to make cappuccinos and lattes. 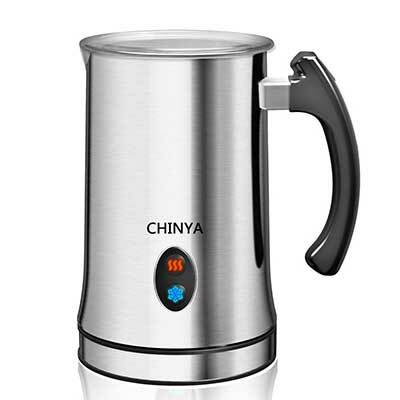 It is another sleek looking design that will help you brew the best cup of coffee or chai latte fast and safely. 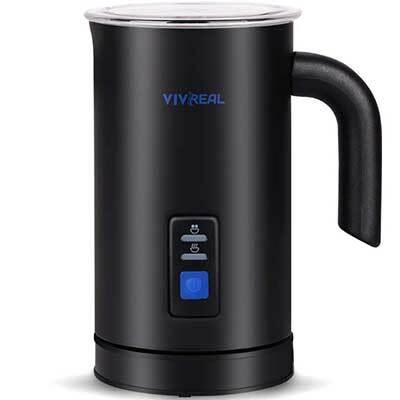 It features a 150ml frothing capacity and 300ml heating capacity. The frother will operate silently and make dense milk froth in less than a minute. Overall, it is one of the best milk frothers on the market for making thick and consistent milk froths. It is a fashionable design made of stainless steel metal and one that can fit anywhere in the kitchen. It I also quite easy to clean with a free cleaning brush included. If you’re looking for foamy, rich, creamy milk, then this is your best milk frother for daily coffee indulgence at home. It is a fancy milk frothing machine with a large 700ml capacity to froth up to three cups of milk at once. The machine is a perfect choice when you have a couple of friends over. It is sturdily made of the durable stainless steel and features a lovely jug spout for easy milk pouring. You also get to choose from two milk options of serrated and smooth. Overall, you get dense and consistency creamy milk. It also features temperature controls to suit every mood. You can also use for any type of milk making it a great buy for every user. This is another leading milk frother to buy this year with excellent features. It perfectly whisks milk into thick and creamy hot or cold foam with small consistent bubbles. It can easily froth milk in less than two minutes. The machine heats milk properly without burning it. It is easy to use with a simple one button ON/OFF control. The machine will take an estimate of 110 seconds to heat milk up to 65 degrees C.it operates silently without making any loud noises. There are no dangerous steams or vibrations. It features a safe see-through lid that prevents splashes but still allows you to view the frothing process. Overall, this is a safe and durable frother with a durable stainless steel construction and non-sticky interior for easy cleaning. The Chef’s star milk frother is our final choice for the best milk frother on the market with a wide range of features. 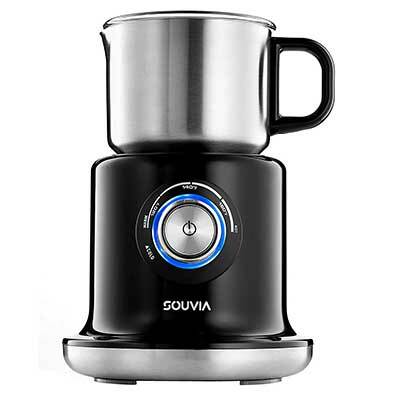 It is a fast working machine with a maximum capacity of 250ml for heating and125ml for frothing. The machine froths milk efficiently delivering smooth and consistent foam at all times. It is also easy to use with a simple press button for turning it ON/OFF. The machine base rotates 360 degrees and can easily be detached for easy handling. It is easy to clean with non-sticky interiors. You also get a one year warranty to buy with confidence. When choosing the best milk frothers, there are a few things you need to consider. It is crucial that every buyer gets to understand their specific needs before making any purchase. Here is a simple buying guide to help you choose the most suitable milk frother. There two types of milk frothers; the handheld and jug style. Handheld frothers are inexpensive and must be held by hand as the whisk spins the milk. Jug style frothers are a bit expensive and come with a beaker and a whisk. They also feature heating and cooling elements to help you warm or cool the milk as you froth. While most milk frothers can froth cow’s milk to perfection, the same does not happen when handling much thicker milk. There are a variety of milk options nowadays ranging from hemp, coconut, almond and soy. The machine you choose should be able to froth your preferred milk without any problems. The best milk frothers need to come with a built-in temperature control. This helps make the ideal layering on a cold day, summer or mid-afternoon. The quality of the construction and materials used are other crucial features that determine the durability of the milk frother. If you are willing to spend a premium price, then go for stainless steel frothers. You can also choose glass milk frothers but then these are quite fragile, and one needs to handle them with care. Lastly, you need to consider the price and ensure it matches with the features and construction of the frother. It should also be backed with a great warranty of at least two years average. 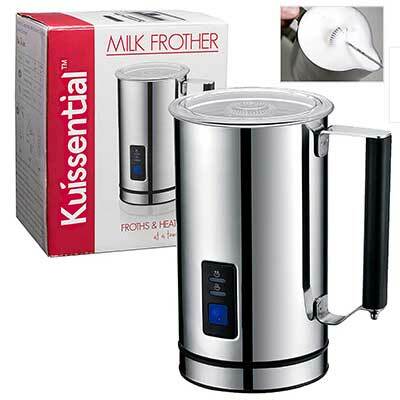 These are the best milk frothers on the market currently and best placed to offer you excellent value for money. The frothers were carefully selected from hundreds of models due to their unique features, sturdy construction and numerous good reviews and recommendations. You can choose any from our list with confidence knowing you are getting good value for your money. Consider our buying guide above and choose a frother closest to what best suits your needs.